AC... oi, I'm confoozled! - A complete newbie guide to armor, AC, and how it all works. This will be a simple (or rather... after writing it all out, detailed) recounting of how AC works in NWN. This same information can be found on the nwnwiki, but I thought I'd make this post for those who don't want to go digging through a number of wiki pages to find all the relevant info. AC is simply the number representing how hard it is to hit a target. DnD and NwN calculate if you get hit by comparing two numbers. Your total AC vs the attacker's total AB. Your total AC is comprised of a number of different smaller numbers. Your dexterity score can add to or subtract from your AC. If it adds or subtracts, and how much so, depends on your final dexterity score. On your character-sheet, you'll see two numbers listed on the line for your dexterity. The number on the left is your dexterity, and the number on the right is the modifier. For any and all of your attributes, the modifier is the (attribute score - 10)/2. So for the example above, Avery's dexterity score is 10, and his dexterity modifier is 0.... (10 - 10)/2=0. If his dexterity were 12, his modifier would be 1, and he would have 1 higher AC than he currently has. If his dexterity were only 8 however, his modifer would be a -1, and his AC would be 1 point lower. The modifier used is your *final* score. In the above example, you'll notice Avery's consitution score is 19, and it's colored green. His *base* consitution is less than 19, but he's wearing an item which boosts his constitution. Same goes for dexterity. He can wear a belt of agility, which will raise his dexterity above it's base, and provide him a greater dexterity score. If that modified dexterity were 12 or higher, he'd have at least +1 more AC. You wear armor on your torso, and hold a shield in your left hand. Armors and shields have a base AC. What base AC they have depends on the type of armor or shield they are; full plate is not the same as leather armor, after all. The base AC from your armor and shield is always added to your own base AC. The example above is Avery's wizard robes. Robes/clothing *are* a type of armor, worn in your armor slot, however, their base AC is 0, so they don't add any base AC. They also don't inhibit Avery in any way, and are very light. The next step up from plain robes/clothes is "padded armor". Padded armor has a base AC of 1, and also requires the "light armor" profiency to wear. After padded comes leather armor, which has a base 2 AC. This increased for each armor type all the way up to Full Plate Armor, which has a base 8 AC. Every armor from padded up to full plate falls into either "light", "medium" or "heavy" armor classes, and requires the feat to equip. Another key difference between the different types of armor is the 'Maximum Dexterity Bonus". 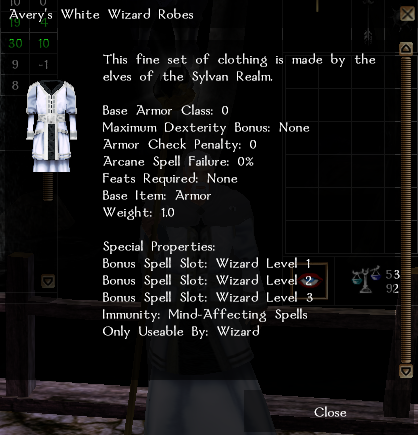 In the above example, Avery's robes don't have a maximum dexterity bonus. That means, the AC he gets from high dexterity is not limited. Padded armor has a maximum dexterity bonus of 8. That means if Avery had 30 dexterity (a +10 modifier), and wore padded armor, he would only benefit from 8 points of that +10 modifier. Full plate armor, the heaviest and most protective base AC armor, has the most restrictive maximum dexterity bonus... 1. So, the higher dexterity you have, the lighter armor you may want to use. Even if you wear full plate, you can gain +1 more AC from dexterity if your total dex score was 12 or higher. Look at your character sheet and compare your dexterity score and modifier to the armor you are considering. If it's max dex bonus allows you to capitalize on more of your dexterity, it may be better for you than the heavier and higher base AC armor. Note too... if you are wearing full plate, and you had 20 dexterity, your modifier would list as 1, even though 20 dexterity gives a +5 modifier.... remove your armor to view your dexterity modifer as it is without any armor restrictions. Shields, like armor, have a base AC. Small shields have a base 1 AC, large shields have a base 2 AC, and tower shields have a base 3 AC. You need the shield proficiency to use shields. Unlike armor, shields do not restrict your dexterity modifier for extra dexterity AC. On both shields and armors, you will see the line "Armor check penalty". This is for dealing with skills, and has no bearing on your AC (except for ride skill AC, which is covered later). The example above is a Shield of Force. It's a small shield with a base AC of 1. It also has bonus AC. Bonus AC is always listed in an item's "Special Properties" section, as well as what -type- of AC it is. There are several types of bonus AC. They are armor, shield, natural, deflection, and dodge. Every item you can equip (except for arrows, bullets and bolts) will give a specific type of bonus AC (if the item indeed has a bonus AC special property on it). Armor and bracers give the armor type of bonus AC (unless otherwise noted on the item... there is a type of bracer in Aenea which gives a shield type bonus). Shields give shield type bonus AC. Amulets give natural type bonus AC. Boots give dodge bonus AC. Weapons, rings, cloaks, helmets, belts, and gauntlets give deflection type bonus AC. Shield and armor bonus AC is separate from your actual armor and shield's base AC... this can, and often does lead to confusion for players. Magic spells and effects can also give you an AC bonus. Like items, spells will give a specific type of armor class bonus, and are restricted by the same rules as items. Refer to a spell's description to find out what type it gives. For each type of bonus AC, you can have a value of +1 to +20 (or even -1 to -20!). With the exception of dodge AC, you can only benefit from a single source of bonus AC for -that- type of bonus AC, and that will be the source with the highest modifer. A cloak which gives a +5 bonus AC and bracers which give +5 bonus AC will stack together for a +10 total, since the cloak is a deflection AC and the bracers are armor AC. A +5 bracer will not stack with a +5 suit of chainmail though, as both give armor type bonus AC. For dodge AC, all your dodge AC bonuses will stack with each other. If you had Gargoyle Boots (which give +2 dodge bonus AC), and a dusty rose prism ioun stone (a magical item that grants +1 dodge AC), you would benefit from a total of +3 bonus dodge AC. There are few sources of bonus dodge AC, but the more you get, the more you can benefit. There's still more sources of AC besides armor, shields, and bonus AC items. These are for the most part class features/feats. These sources give bonus AC, but they do not count towards any bonus AC and/or that type of bonus AC's +20 cap with only a few exceptions. All these sources will stack with eachother. Expertise/improved expertise. These feats give you +5 and +10 AC respectively at the penalty of -5 and -10 to your attack rolls. This AC is always added to your total AC. Armor Skin. This epic level general feat grants you +2 AC. Monk Wisdom AC. Monk's gain their wisdom modifier (if positive) to their AC when they do not use shields or armor (padded armor or higher). Monk Base AC bonus. Monks, also gain a base AC bonus based on their class level. This is separate from their wisdom AC, and stacks with that wisdom AC. Palemaster Boneskin. Palemasters gain bonus AC based on their class level. Red Dragon Disciple Draconic Armor. RDD's gain bonus AC based on their class level. Note, while Dragonsouls are essentially the same as RDD's, dragonsouls receive a dodge bonus, which is subject to the +20 dodge cap. Battle training vs Giants. This racial feat for dwarves and gnomes grants a +4 AC bonus against attack from creatures of the "Giant" racial type. Dodge (feat). This feat grants +1 AC against your current or last attacker. Mobility. This feat grants +4 AC against attacks of opportunity. Tumble. The tumble skill can grant bonus AC. For every 5 points of your base (not your modified) tumble score, you gain +1 AC (to a maximum of +8 AC for 40 base tumble skill). This AC is -not- affected by your modified tumble score listed on your character sheet, either postive or negative. Your base tumble skill is the number in your skills window in the level-up screen. Tumble AC, although in the "other" type of AC bonus, counts towards touch attacks, but is lost when you're caught flatfooted. Size Modifier. The physical size of the character/creature affects it's armor class. Generally, the larger, the easier to hit, the smaller, the harder to hit. For player-characters, there are generally 2 categories they fall into. Medium (no modifier, humans, half-elves, elves dwarves, and half-orcs), or small (aka, small stature... gnomes and halflings are in this category). Player-characters can acquire different size categories through several means. Shifters and druids who shapechange into a dragon fall into the huge category (-2 AC) while in that shape. Warhulks who leave their "sc hulk nochange" option set to on, will shift into the "large" (-1 AC) category while channelling, as their appearance changes to that of a giant. Each polymorph/shapechange will belong to a certain size category. There are several other feats/skills which provide AC bonuses.... these fall into the "dodge" category and are subject to the +20 cap. Divine Shield. This cleric/paladin/blackguard feat conversts a "turn undead" use into an AC bonus equal to their charisma modifier. This is a dodge bonus. Defensive Stance. This Dwarven Defender feat gives +4 dodge bonus. Bard Song. Bard song (regular bard song) can give an dodge AC bonus depending on the bard's perform skill and class level. Ride. Characters with the "mounted combat" feat can gain a dodge AC bonus while mounted on a round-to-round basis. The exact amount gained is +1 for every 5 points of a skill roll over 10. Ride skill is a dexterity based skill, so it's modifier is added to (or subtracted if negative) from your skill roll. 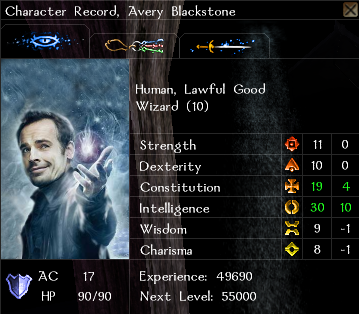 For example, if our example wizard from earlier, Avery, had the mounted combat feat, and 20 ride skill, while mounted, he could gain anywhere from +2 to +6 AC (the skill roll is ((1d20+20+0)-10)/5). Unlike tumble bonus AC, your armor check penalty comes into play here... if your armor has a skill penalty of -5, you subtract 5 from your ride skill rolls). Shadow Evade. This Shadowdancer ability grants dodge AC based on class level. Warblade of Torgat. Not postive, but the AC from the warblade abilities is a dodge bonus as far as I know. Haste. Same as the spell, the item property "Haste" grants +4 dodge AC. Wait.... I added up X, Y, and Z, and it comes out to one number, but my character sheet says another! A sad fact of NWN.... the character sheet lies. It doesn't do it -all- the time, but just enough to make it not 100% reliable. The number you see on your character sheet includes *most* of your AC modifiers. It won't include such things as "dodge" and "mobility (since those are situational... not for every attack), nor for "small stature" (even though that does apply for every attack made against you). The only way to find out for absolute certainty what your final AC is will be to examine the combat log. If you calculate your total AC to be 38, then in the combat log, attacks made against you should only hit on rolls equal to 38 or more (not counting natural 20 rolls by the attacker, which always hit). The combat log will also tell you if it's a normal attack, or a touch attack, so you know what modifiers are included or not. Flat footed is -not- reported in the combat log, but you can find that out by sitting still and not retaliating while you let a baddie swing at you and then examining the numbers for the various hits and misses by the attacker. Also... note that AC bonuses listed as "+# AC bonus Against XXXX" will not show up on your character sheet. These are very specific bonuses that will only apply when the attack comes from a creature of the group listed in the bonus. These specific AC bonuses are still subject to the stacking rules... so that +5 shield that also has a +3 against undead... it's only gonna give you +5 against attacks from the undead, not +8. You shift into the new form, and gain it's dexterity (be it more or less than your natural dexterity), and any specific AC bonuses applied to that shape. Depending on the shape, only portions of your items will "Merge" into the new shape. Of the items you have that do merge, only ONE source of bonus AC items will merge, and that will be your highest bonus AC item, and that AC bonus will always be converted to a "deflection" bonus, no matter what the original source was. If you had on a +5 armor, that +5 armor AC bonus will be a +5 deflection AC bonus while you are shapeshifted/polymorphed. Under the current default NWN rules, bracers/gauntlets never merge with anyshape, so those nice +8 bracers are utterly worthless to shifters and any other shapechangers. Spell/magic effects are not affected by shapechanging/polymorphing. Only properties on items. 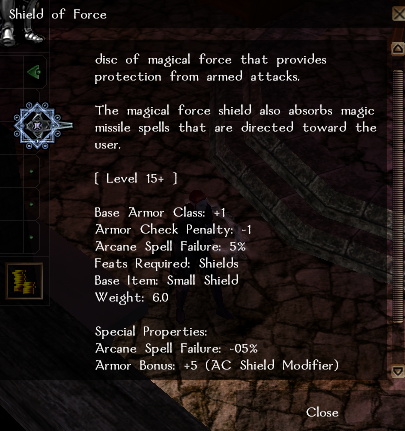 So if you had a +5 armor, and also had a barkskin spell and a Shield spell in effect, your armor's AC bonus would be converted to deflection, but the shield and barkskin spells would not be effected. The stacking rules still apply, so barkskin spell would still boost your AC, but the +5 from the armor is now deflection, and the +4 from the shield spell will not stack onto that. Attacks.... Not all attacks are the same. So you add up all your modifiers and such, and while wearing your full plate and tower shield with 12 dexterity, +5 bonus gear (and a +8 bracer), 20 tumble.... you have 54 AC. Not bad! You venture into the underdark and come face to face with a beholder... and find yourself dead before you (or the beholder) can blink. You check your combat log... and the beholder was hitting your 50 AC with attack rolls barely over 30... WTF? There are two basic kinds of attacks. Regular ol' attacks, and "touch attacks". Both come in regular and ranged varieties, but that has nothing to do with AC, just relates to how far away they can hit you from... we're just gonna be concerned with 'regular' vs 'touch' attacks. Touch attacks are nasty because they basically ignore portions of your AC. They are called "touch" attacks, because they just have to "touch" you as it were.. not just hit hard enough to penetrate your various armors and other protections. Touch attacks ignore armor (your actual worn armor and shield) as well as your natural, armor, shield and your "other" type of AC bonuses. or even shorter, your 54 AC just got whittled down to an effective 26. Bummer. Dex-based characters are thus more protected against touch attacks than the full-plate wearing characters. There's one last factor in your AC to consider as well. Being caught "Flat footed". Being "Flat footed" means basically not engaged in combat, or more precisely, not actively turning an enemy into a pile of goo. When you're caught flat footed, it's like the reverse of a "touch" attack. Instead of losing your armor/shield/natural AC's though, you lose your dexterity AC and your dodge AC. Most often, you get caught flat-footed when you're just standing there, an enemy attacks you, and you lose the initiative roll (they attack first), or, as a spell caster, you finish casting a spell, but have not queued up your next action (which leaves you just standing there). The only way to avoid losing all that AC is to have the "uncanny dodge" feat, a feat granted to rogues, barbarians, assassins, and shadowdancers. With uncanny dodge, you will keep your dexterity AC and lose only your dodge bonus AC. So... if you haven't fallen asleep... let's show an example of everything. Tommy-Twofoot is your average hafling rogue, with 6 levels of shadowdancer. He is level 21, has 16 dexterity, 20 base tumble skill, and 10 ride skill, with the mounted combat feat and the uncanny dodge feat. Tommy, like every other being, has a base AC of 10. To that he adds his various modifiers, armors, ect. Against touch attacks, his effective AC is 26. When caught flatfooted, his effective AC is 30, although without uncanny dodge, it would only be 27. If Tommy activated his "Shadow evade" shadowdancer ability, at level 6 shadowdancer, his AC would go up by 2, for a total of 39, 28 vs touch attacks, but still 30 when caught flatfooted. If Tommy found Bracers of Full Plate Armor (+8 armor bonus... only named "Full plate" because their bonus is +8, the same number as the base AC of fullplate armor)... his AC would only go up by 4, as his leather armor is already +4, and armor bonus does not stack, only the highest value is used. For those who don't want to fuss with any math... a quick chart for base armors, and what levels of dexterity get the most out of a given type of armor. Re: AC... oi, I'm confoozled! - A complete newbie guide to armor, AC, and how it all works. Ah, and one last factor to consider with AC in general, although it doesn't affect your AC number directly. Concealment ranges in a percentage. Sources of concealment include the spells "Path of fog", "Displacement", "improved invisibility", the feats "Empty body", "Shadow evade", self-concealment I through V, and the shadowchild subrace concealment. Concealment doesn't alter your AC, but it makes you harder to hit, depending on your concealment percentage. If you had 50% concealment, basically, half the attacks made against you will fail to hit, even if the attacker's roll was sufficient to hit your AC. With 20% concealment, only 20% of the attacks (or 1 out of every 10) would miss you outright. Like with AC, higher numbers are always better. Shadowchild concealment is 20%. Self Concealment comes in increments of 10 (10% for self concealment 1, 50% for self concealment 5), shadow evade provides anywhere from 5% to 20% depending on the shadowdancer class level, and all the other sources mentioned are 50%. so, let me get this right...you keep all this stuff in yer head? And you can access it at will. I am awed, and humbled. One tiny, itty-bitty correction, I think. You have tommy's touch attack AC listed as 29. I believe it should be 26. I am pretty sure he loses 11 points of AC total when targeted by a touch attack. He would lose 2 points of his base armor (leather armor), 4 points of armor bonus (+4 bonus on his leather armor), 3 natural armor from his amulet, and 2 from his armor skin feat (im not 100% on this, but I am almost positive Ive tested it, just cant remember for certain). If that is correct his touch AC would be 26 or 28.
quite correct... missed subtracting the natural when I was totaling up the numbers. **edit: Moved this post's content up into the first post. Damn ... thanks for this, manny! Very nice! Great work there Manny! MannyJabrielle just gave us one of the most lucid, patient, and thorough lectures in AC 101. I always think to myself, in regards to Touch attacks, remember the 3 D's - Deflection, Dex, and Dodge. Rule of Thumb regarding when Dodge AC is lost - Everybody looses Dodge AC if they're being physically attacked and not fighting back (with melee/ranged weapons, or spells) even with Uncanny Dodge. Very good of you to provide this for us! Time Zone : \"GMT - 5:00\"
Moved the Armor/Max Dex bonus table into the main post. Added a list of spells and what kind of AC bonus they give. I *think* the list is complete... please let me know if I missed any. Added in a note in the "character sheet lies" section about Bonus AC Vs XXXX and how such specific AC bonuses do not show in your character sheet. Also gave a quick summary about what happens to bonus AC when you shapeshift/polymorph. , methinks we need a sticky? Also a note that Haste will not stack with Mass Haste and vice versa. Might be worth including Bigby's Interposing Hand, as well... even thought it applies a -10 penalty to the enemies' attack bonus, rather than a bonus to the casters AC, it still effectively changes the to hit roll, and basically will stack with any other AC bonuses as a result.